It was a full travel day to get from Singapore to our final stop for the day in Bangkok. 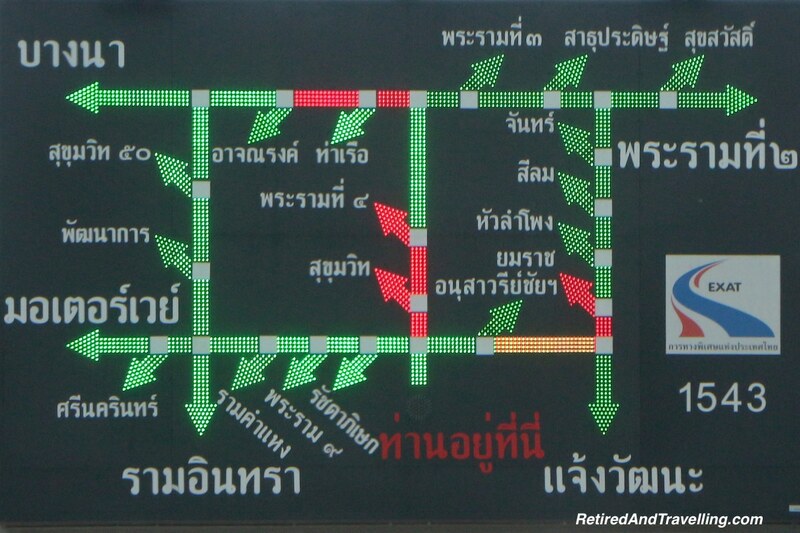 We were yet undecided if we would stay in Thailand and start by exploring Bangkok by day and Bangkok by night or if we would head home early. Landing at the airport, we got a taxi from the booth inside the airport. This would often be our choice. There may be a small premium over hailing a taxi at the curb but the rate would be fixed and we would get into the cab with a piece of paper clearly telling the driver where we were going. Our taxi driver still tried to scam even more money. 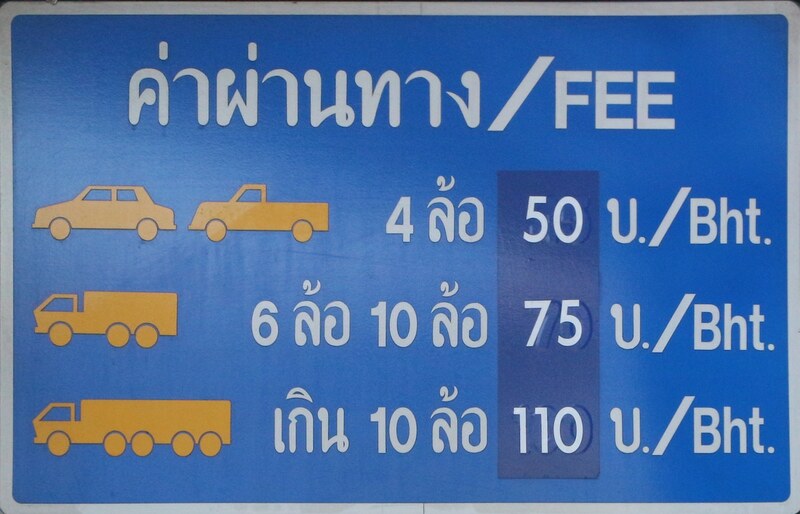 The driver suggested that the base fare did not include using highways and that the trip would take 2 hours unless we paid a mere additional fee of 150TBT (Thai Bhat) (about $5.50 CDN) on top of the 850TBT already paid. It was not the actual amount that was annoying but rather the assumption that we would just pay this “tax”. We smiled and said the scenic trip would be just fine for us! Once the driver realized he was not going to con us, he pulled up onto the highway and paid the 50TBT for the toll. The expressway moving well. He was not going to waste 2 hours of his day when he realized we were not to be conned. Once you have agreed to a fixed rate, it should be fixed! Be prepared to pay inflated taxi prices when you are a captive audience. Rides to and from the airport are a perfect example. The taxis waiting outside the major tourist areas also know they can generally name their prices. Exhausted, hot tourists just want to go home and are paying for a taxi to get some air conditioning. Don’t accept the first price but expect that the ride will cost you more than if you walked a few blocks or if you were local. Just make sure you know in advance what you are prepared to pay. Would We Stay In Thailand? 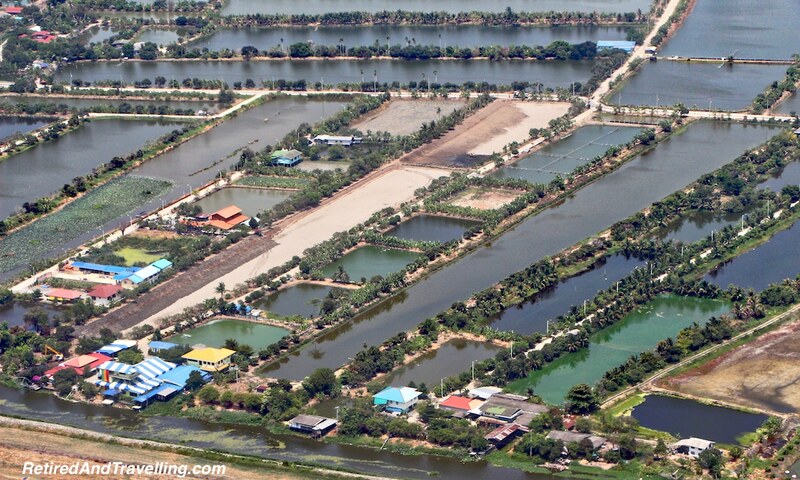 We had booked 3 days in Bangkok and were still undecided how long we were staying in Thailand. I had picked up a lower respiratory tract infection in Australia and had been fighting it through a week in Bali and then through 3 days in Singapore. If you have ever had lung problems, you will know that traveling in SE Asia in 35℃ temperatures (95℉) with close to 100% humidity makes every step hard. 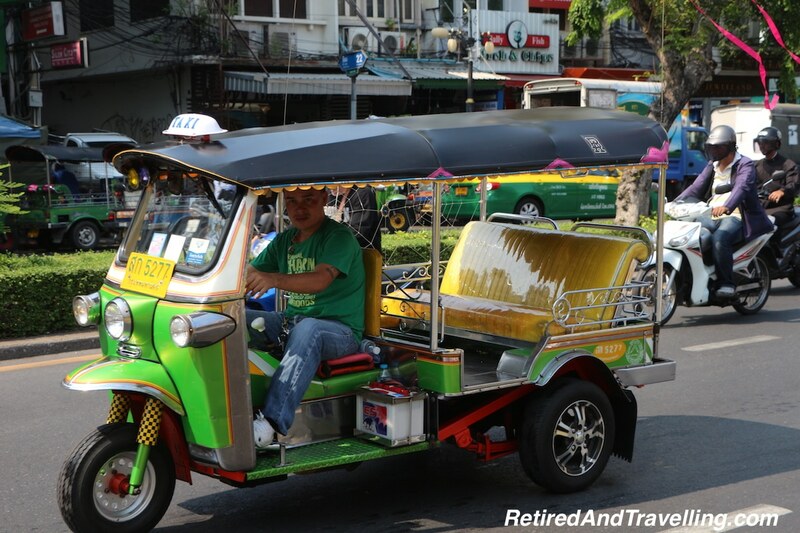 We took it easy the first day in Bangkok to let me assess whether we were staying in Thailand or re-booking our flight back to Toronto early. By the second day in Bangkok, I had recovered from the travel day. 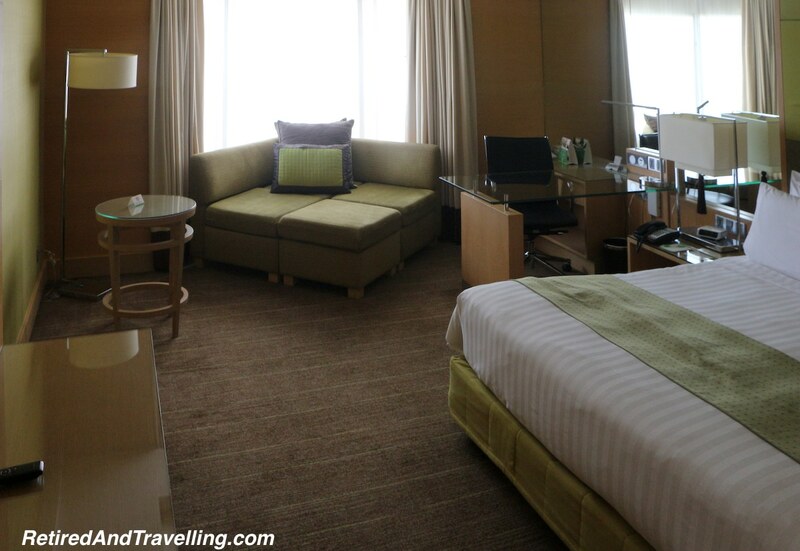 Our large executive club room at the Bangkok Holiday Inn Silom was a calming refuge. Customer service was excellent on the executive floor, whether it was for a hot breakfast, coffee through the day or for the comprehensive happy hour drinks and food service. Bangkok heat, humidity and general bad air quality might keep me moving slow as we explored Bangkok by day, but I was convinced that I could handle 10 more days being a lazy beach bum by the sea. We spent some time on the internet considering options for Thailand destinations, travel and hotels and finally decided we would spend a week in Krabi and then a few days in Phuket and return home on our originally scheduled flights. 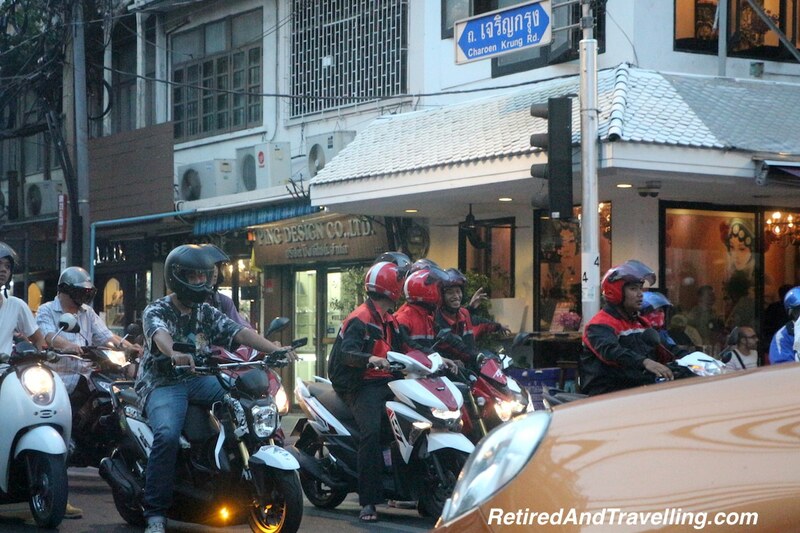 We returned to Bangkok for one night at the end of our Thailand visit before our trip home. 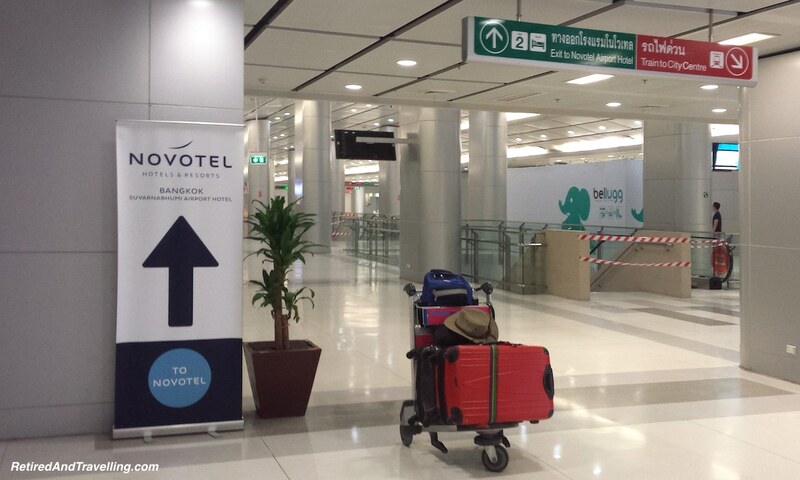 Since our flight was relatively early, we decided to stay in the Airport Novotel and make it easy for us. When we arrived at the airport, we found it impossible to find signs or anyone to help with directions to the hotel shuttle. I kicked myself for not downloading that info before we flew. We wandered around until we finally found signs to the hotel directing us down and down. Ultimately we found the underground tunnel and hauled our bags for about 10 minutes until we climbed back up to the hotel lobby. This is a relatively easy walk (especially if you find airport luggage carts) but we took the free shuttle in the morning back to the airport. Since we had such success with Executive Club service at other hotels, we had booked this level again. It was quickly evident that we were not going to get the same level of service or attention. The room was great but the lounge service was surly and the food cold. Certainly not what we had come to expect. But it made our final transit through Bangkok easier. 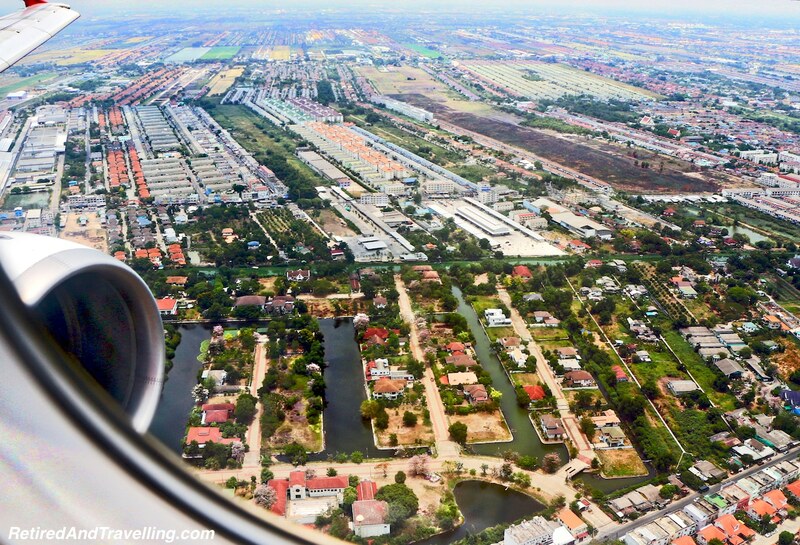 With the train to the city right at the airport, we might even consider staying at the airport if we were only in Bangkok for a short stay or enroute to somewhere else in Thailand. The hotel even has an 8 hour package if you need a room for a short layover! 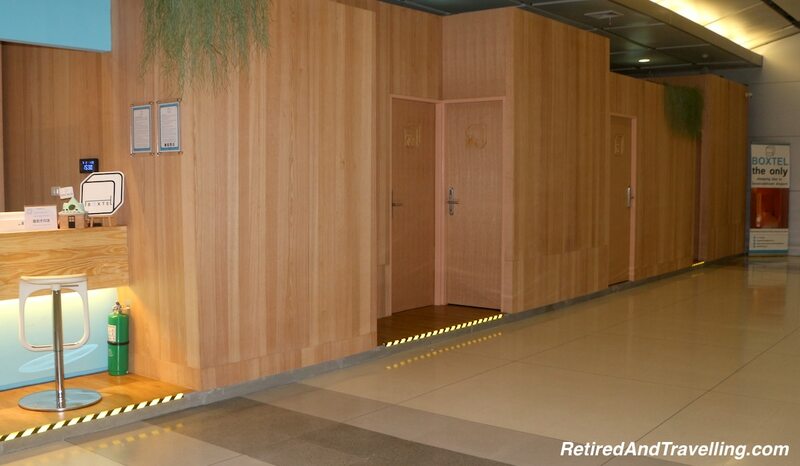 But if you want an even less conventional way to take a nap at the airport, head towards the Airport Novotel signs and you will see signs for the Boxtel “box” to rent. We did not look in to see how small they actually were inside or how much noise was muffled, but if you find yourself in Bangkok for an extended transfer time and you don’t have lounge access, this may be just the thing for you. We had two days to explore Bangkok by day. 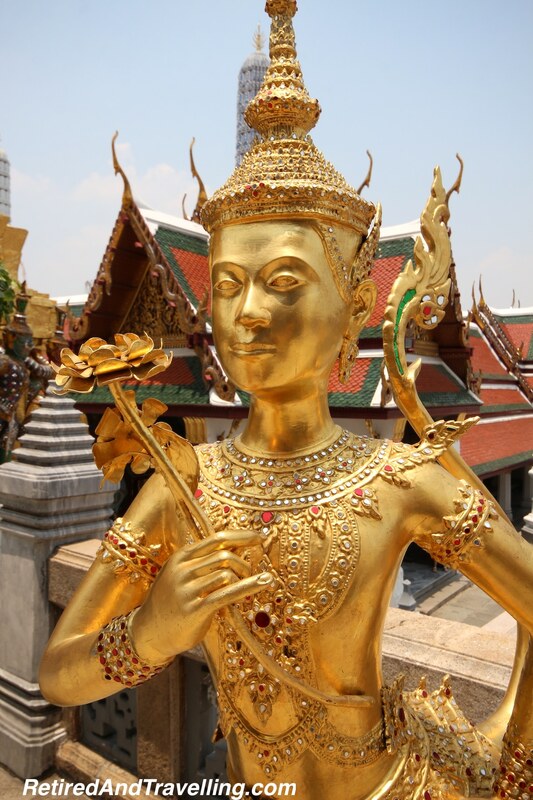 As a gateway city, we knew that we would likely be back through Bangkok when we visited Thailand or SE Asia again and thus we did not need to imagine that we could see it all in two days. 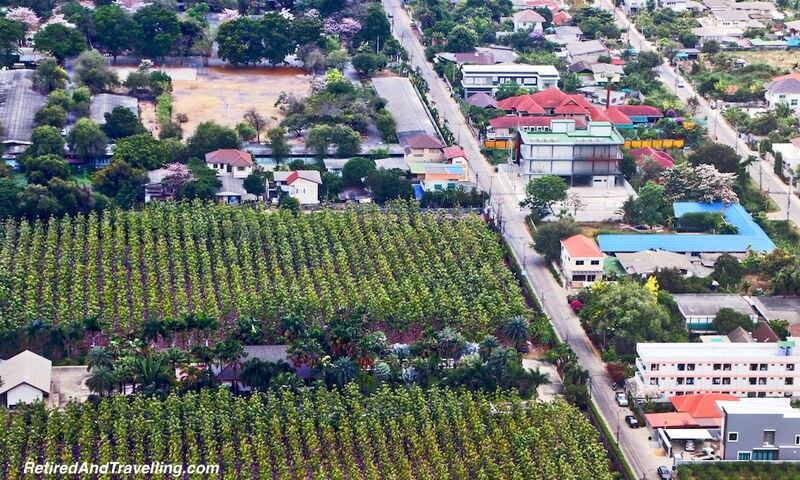 Bangkok is an industrialized city with a large central business district populated with tall buildings. 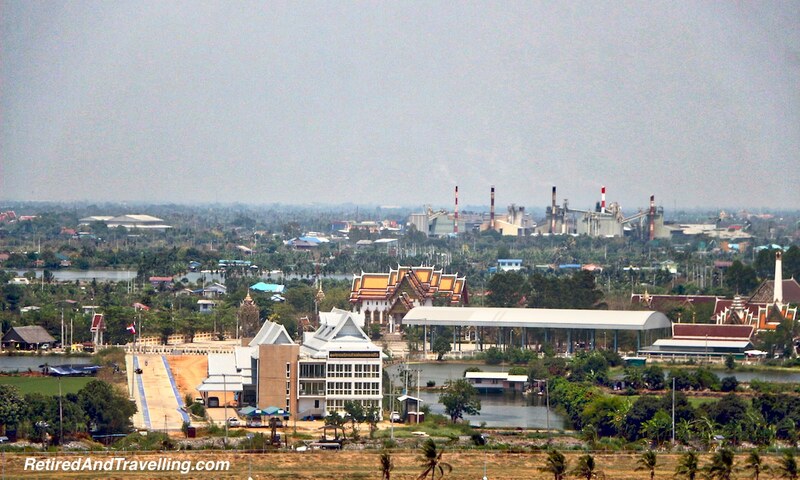 But we could also see the city spread out over a vast area with a mix of housing, temples, industrial areas and patches of green space with water growing areas spread around. While we had found Singapore to be large and developed, it was clean and green and a delight to visit. 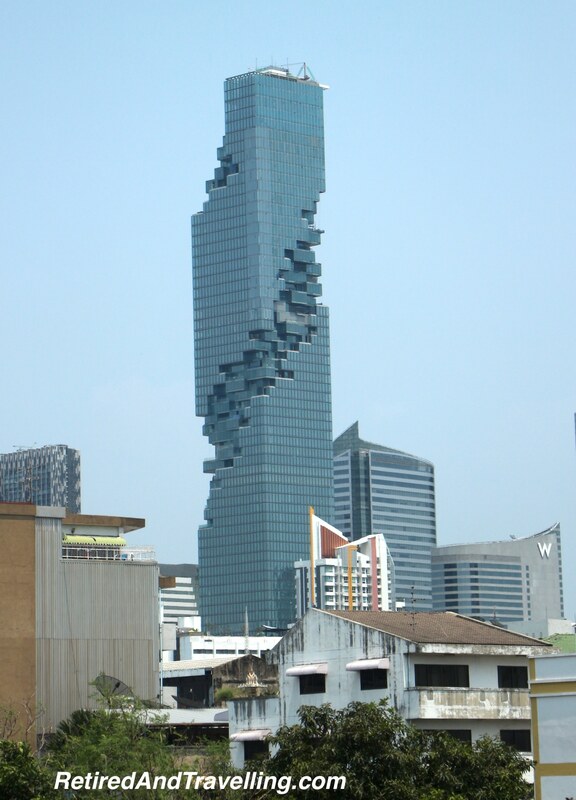 Bangkok was not going to prove to be quite as nice a city to move around. The traffic chaos was evident. We were back to a land of crazy scooter drivers, driving with less civility than the orderly mayhem we had seen when we travelled the scooter crazy streets of Bali. Added into the mix were the tuk tuk drivers. In my mind I had pictured a tuk tuk to look like a rickshaw (pulled by a human being) but we found the tuk tuks to be narrow open air mini-buses, more resembling the Gorilla vehicles we found all over Italy. Really designed to carry 2 passengers, you often found them with 4 passengers squeezed in. The tuk tuk drivers acted very much like the scooters – driving anywhere and squeezing into any open slot. 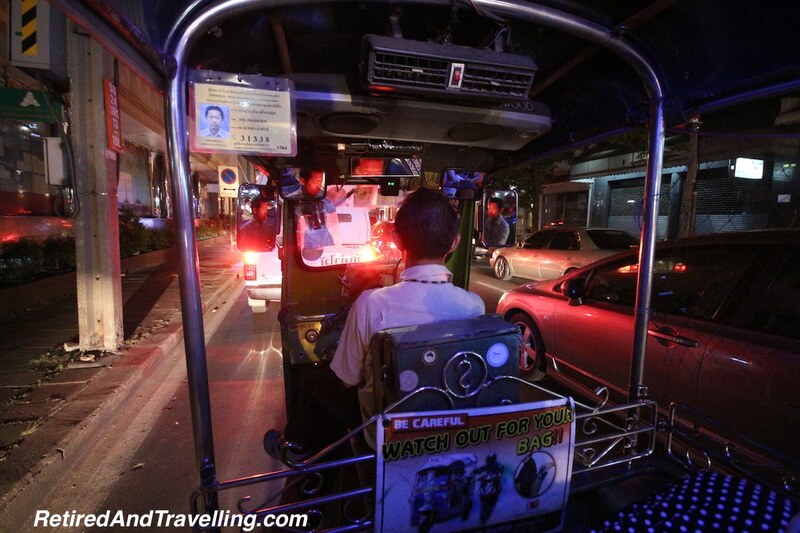 While we had been warned about taking tuk tuks, we did 2 rides and just held tight. 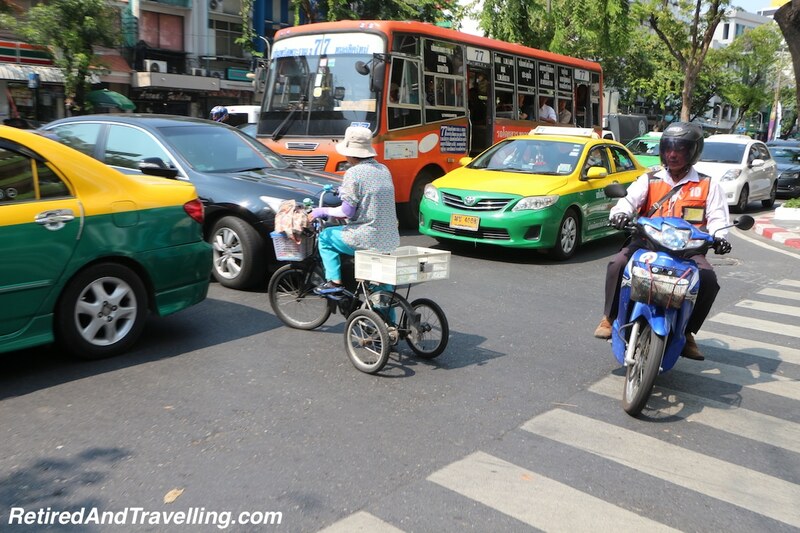 If you take a taxi or a tuk tuk, make sure you are getting a direct route. We were offered a tuk tuk ride for 100TBT with “one stop” or for 200TBT for no stops. The one stop is typically a store (often a tailor) where you are hustled to buy. We talked to one couple who had several stops before they finally got to their destination. Insist on a direct route. 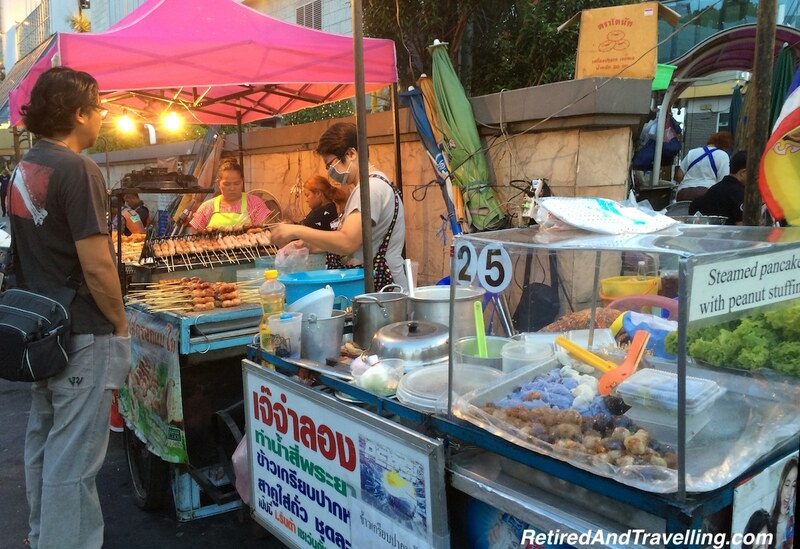 There is great food to be found everywhere in Bangkok, whether in a restaurant or on a street cart. You can find every kind of Thai food, fresh fruit or the ever present pancakes. If you have a sensitive stomach, you may want to be careful what you eat from where. 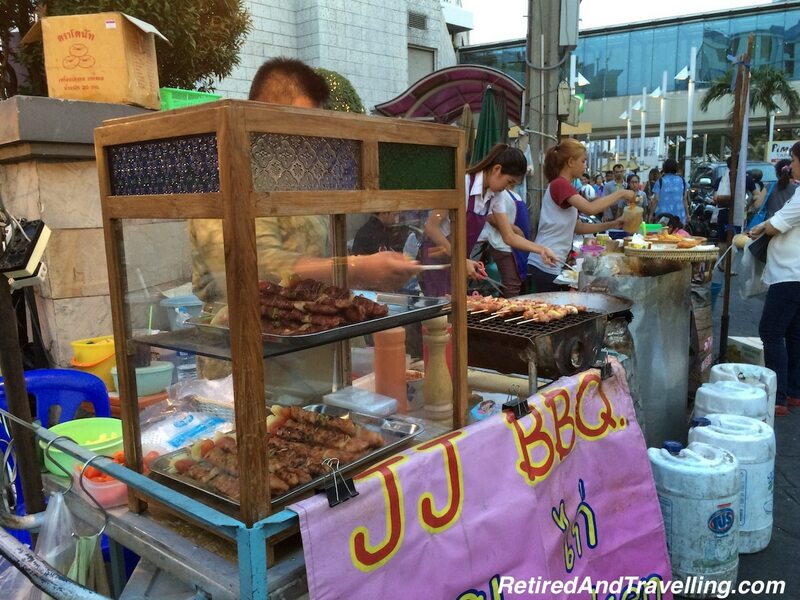 We picked up travellers belly when in Bangkok and it took over a week to resolve. We were surprised to find that Thailand, like Bali, had a high number of Italian restaurants. It was always a safe choice for me when I was in need of a break from Thai food. If you need a relaxing break, you can always plan for a spa day. The massage prices might tempt you to try a different kind of massage every day. For 500TBT (or less than $20CND) you can get a 2 hour massage! We had really enjoyed our visits to the temples of Bali. 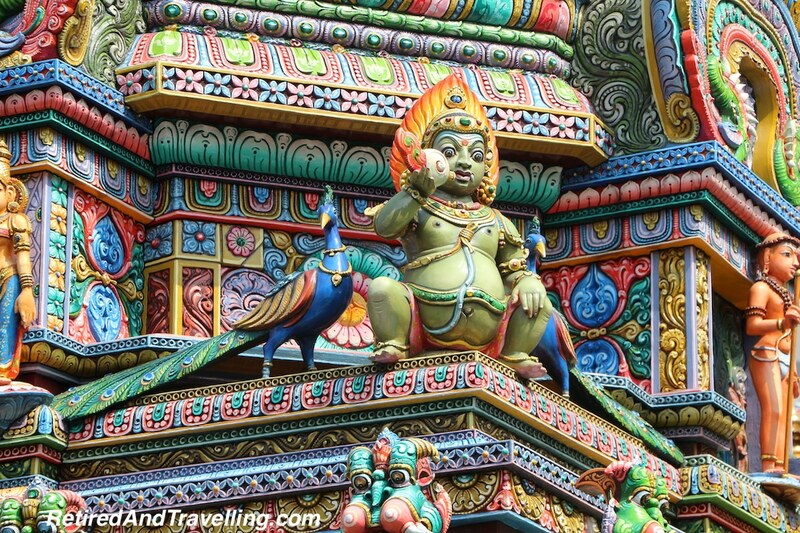 So when visiting Bangkok by day, there were a number of beautiful Bangkok temples on our agenda. 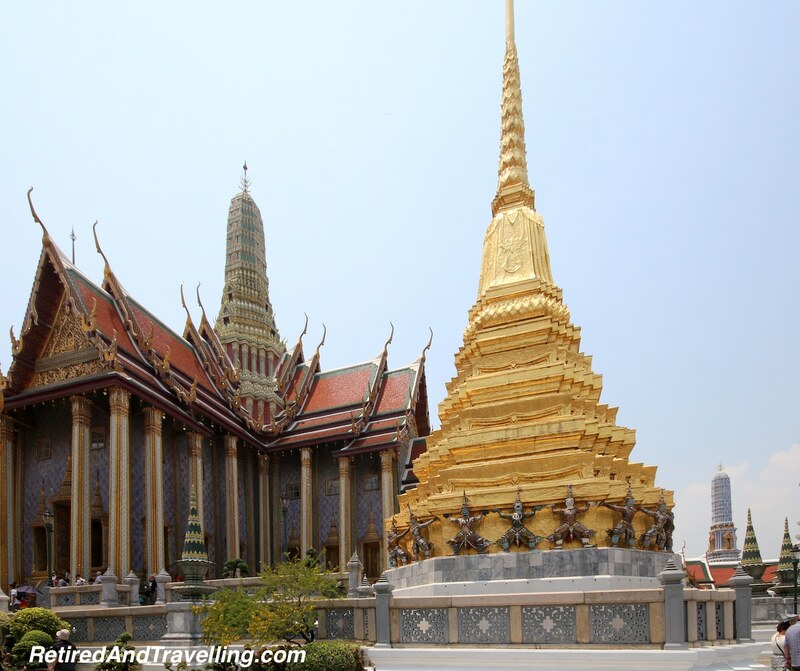 Despite spending the day, we saw only some of the Grand Palace and Emerald Buddha Temple. But that was as far as we got travelling that day in Bangkok. 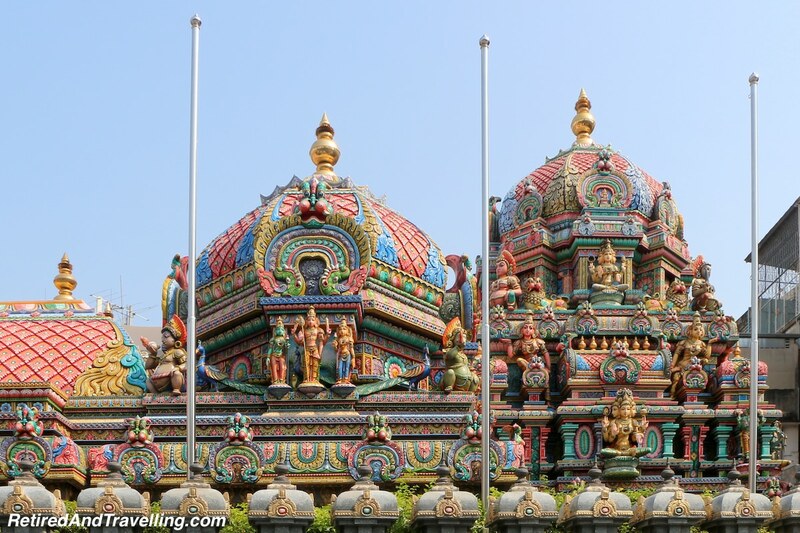 The other temple that was on our list during this visit to Bangkok by day was the Sri Mahamariamman Temple. This Indian temple close to our hotel was a fully operational temple. Tourists were tolerated and no photography was allowed. 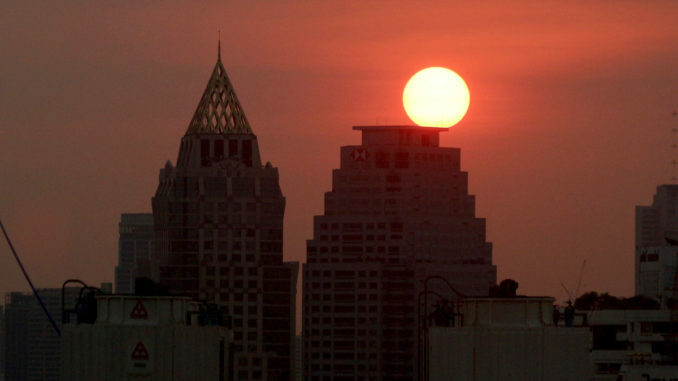 If you survived Bangkok by day, you were in for a bit of a different flavour at night. I had wanted to do a river cruise in Bangkok. The research I did suggested that a night river cruise would give you a bit more magic. 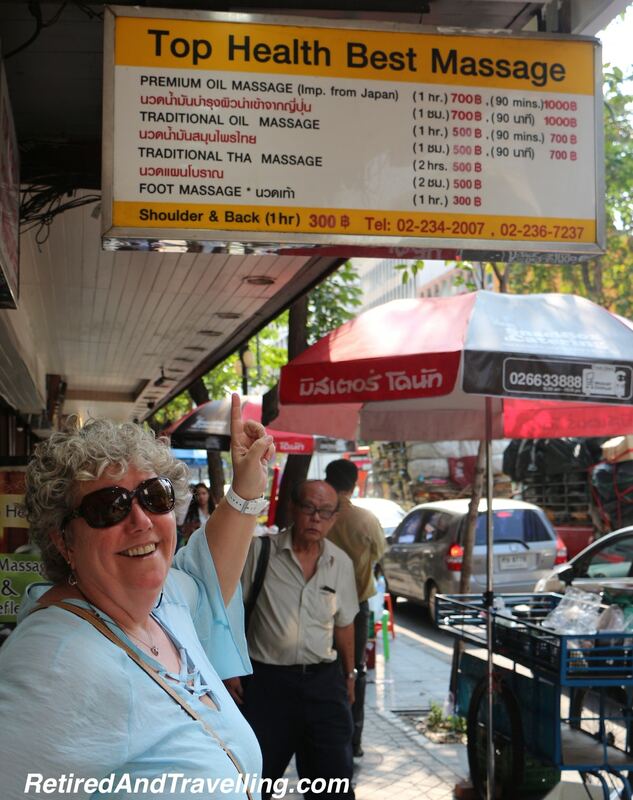 If you are more adventurous like our travelling son Nick, you might even venture into the Khaosan neighbourhood. Known for the night life, you can find all kinds of after dark fun. When Nick sent me pictures of them eating fried scorpions from a street vendor, I was glad we had missed that night fun in Bangkok. 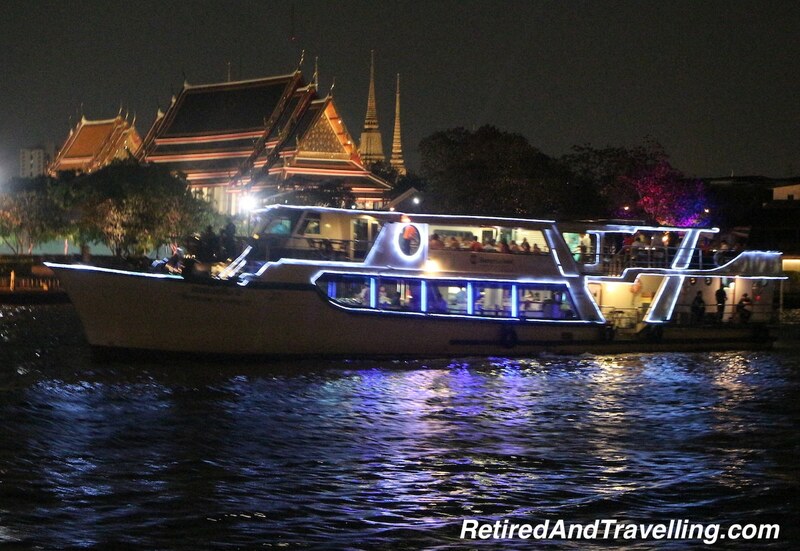 Whether you travel around Bangkok by day or by night, you will find a lot to see and do. The heat and traffic will slow you down, so don’t be too ambitious in your planning. If you plan to visit Thailand or SE Asia a few times, you can always use Bangkok as your gateway and spread your sightseeing over many trips. 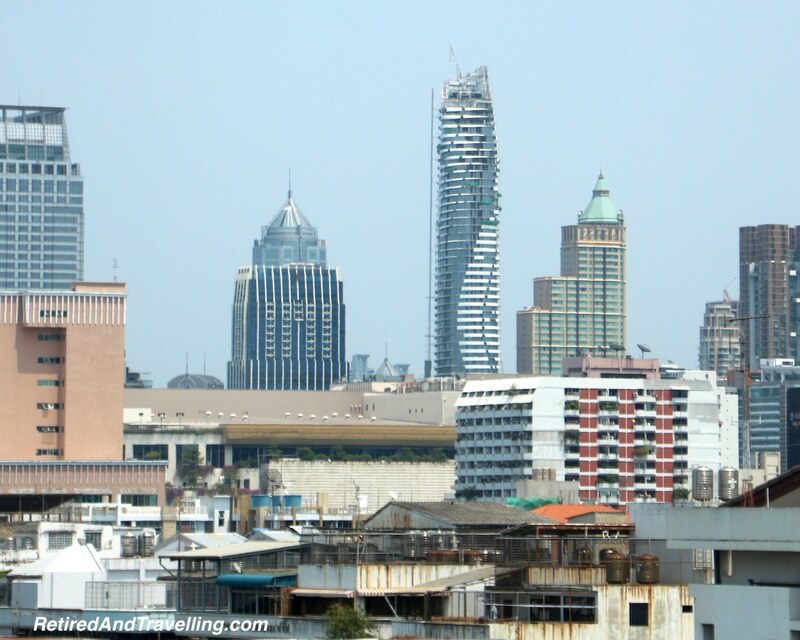 Bangkok had proved to be a good starting point before we headed off to the beaches of Krabi! 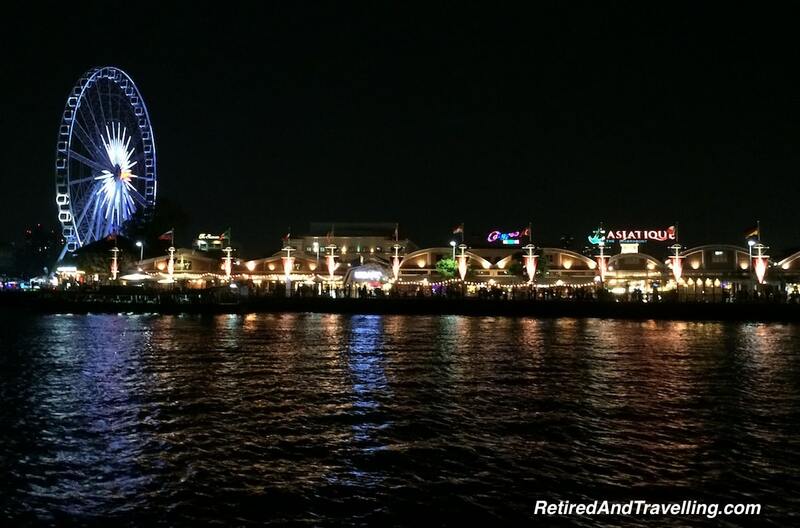 Did you like Bangkok by day or by night? What was your favourite site? What is not worth the trip? Nice blog! We really liked Bangkok, but it is dirty and chaotic. The Thai people we met were very friendly and it comparison to other spots in SE Asia, knew why Thailand is called the Land of Smiles. Tuk Tuk is a great way to see some of the further away temples, but yes, if you understand that if you want a lower price they will drop you off at a sponsor temporarily to receive their commission, then it is all good👍 Thanks for sharing guys.